The words of a Bea­t­les song, “a long and wind­ing road that leads to who knows where” are the words that come to mind when I first dis­cov­ered this road while explor­ing with a friend of mine. A few days lat­er I returned with my cam­era to cap­ture the beau­ty that was so cap­ti­vat­ing. I knew I had to time it out just right, hop­ing the leaves had turned with deep­er reds, yel­lows, rust and before the next storm would wipe them off the trees. As I trav­eled through the canopy of trees that lined the one lane road, my mind just kept focus­ing on the beau­ti­ful can­vas God him­self had cre­at­ed. 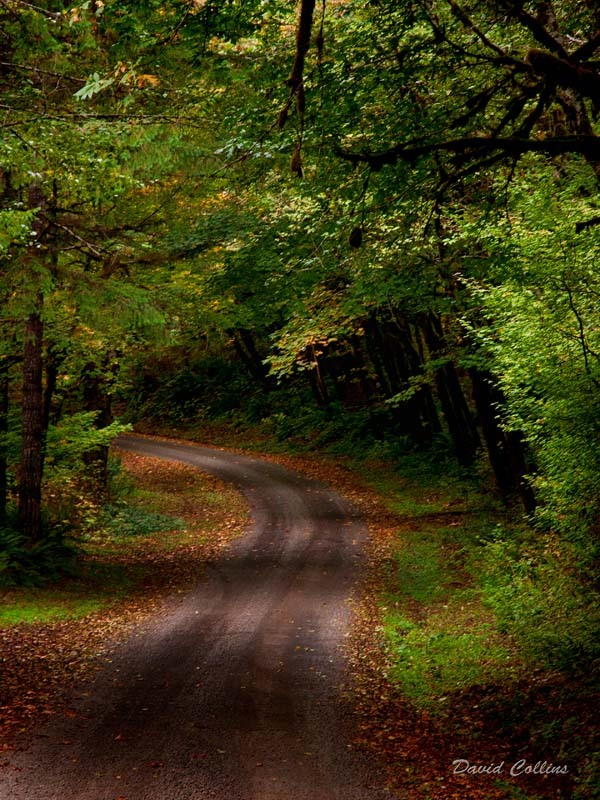 Every turn around the next bend the trees would pop with bril­liant Fall col­ors. 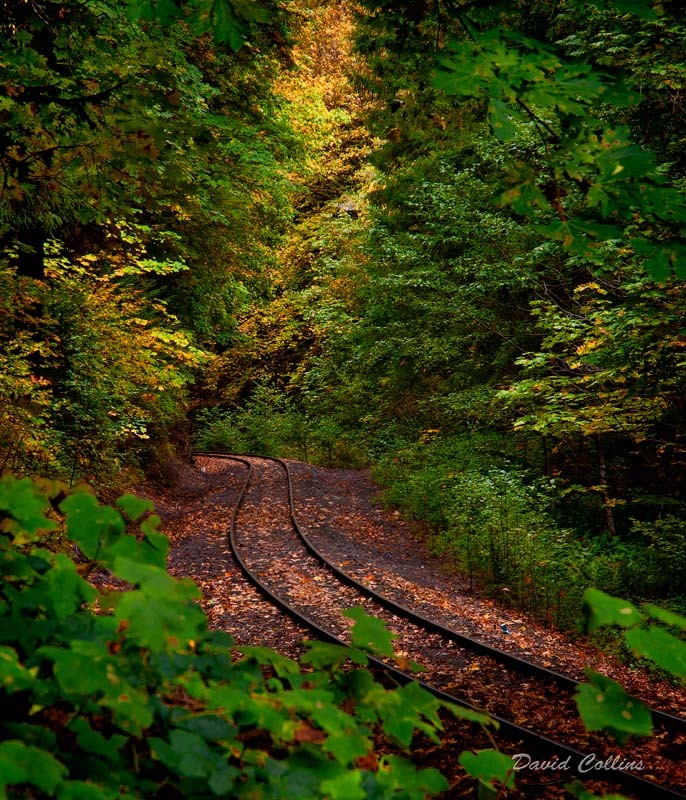 One of the pho­tographs that I’ve always had in the back of my mind to cap­ture, involved curved rail­road tracks with trees, but I nev­er dreamed I would find my dream shot nes­tled in the Fall col­ors in the moun­tain area 20 min­utes from my home. I can only imag­ine the scenes I missed had I walked the miles of track that ran along the route. In a ten mile stretch along the road I crossed the tracks at least five times, each hav­ing it’s unique look and beau­ty. Did I men­tion that the entire route fol­lows a riv­er. Nor­mal­ly I see the riv­er from a high­way that I dri­ve on the oth­er side, how­ev­er there is no place to pull off to real­ly wit­ness the beau­ty this area offers. This time of year the riv­er is very low and slow mov­ing. Once the rains begin, this riv­er is fast paced with dif­fer­ent water lev­els through­out the year. I will be return­ing this win­ter to cap­ture the beau­ty once again. I am blessed to live in an area of Ore­gon where my home is sur­round­ed by large pine trees, I can be at the ocean in five min­utes, or I can be at a place like this in less than 20 min­utes. I’ve been told I live in Par­adise, and to be hon­est, I do!! I thank God every day for the coun­try and place my wife and I live. I am tru­ly blessed. 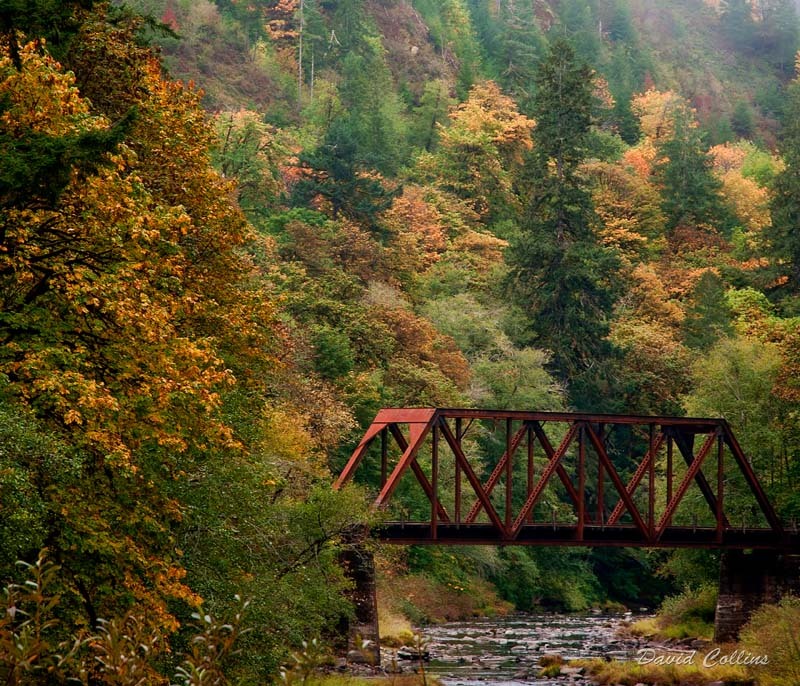 This entry was posted in In the Mountains, Out and About, Rivers and Streams and tagged Fall Colors, Florence Oregon Photography, Oregon Coast Landscape Photos. Bookmark the permalink. Wow! Count me as one who thinks you live in par­adise! 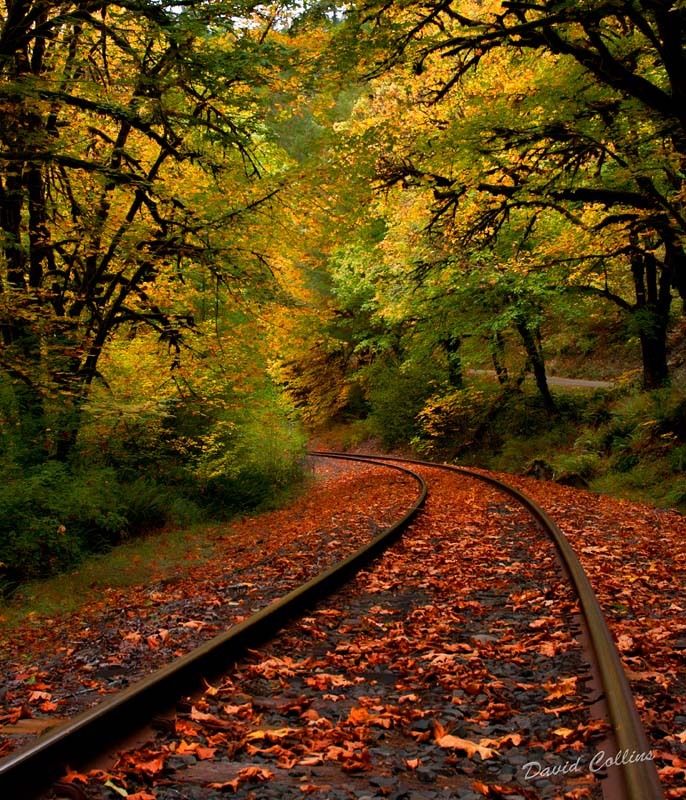 I too love rail­road track scenes, and this one has to be one of the best of the best — through your lens that is! THANK YOU for tak­ing us along on this amaz­ing ride through this beau­ty! 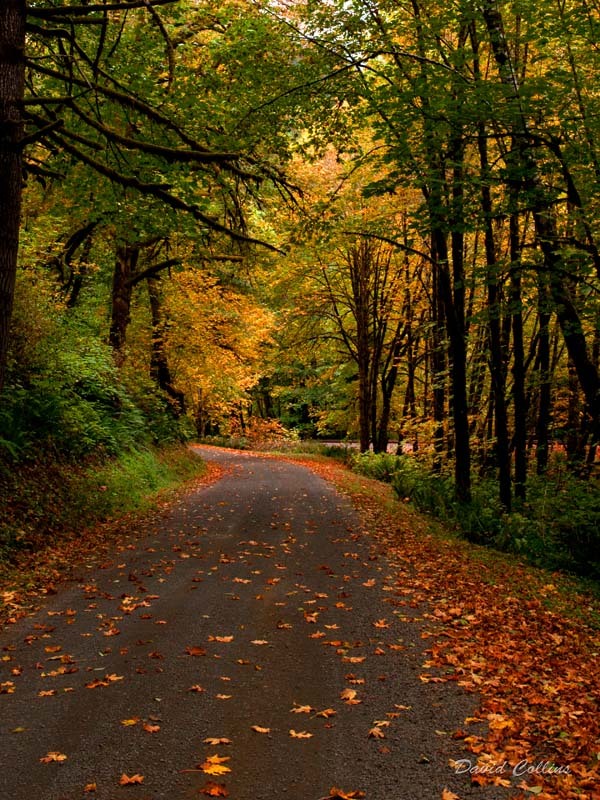 It is tru­ly breath­tak­ing dressed in its autumn fin­ery!